assist people of all ages with low to complex support needs to be engaged and valued members of their communities. 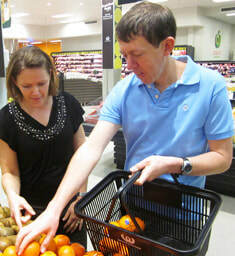 Each participant is supported with an individualised program experience that responds uniquely to their needs and aspirations. Life Stream Australia’s Community Access and Skill Development programs enhance each participants interests and strengths by assisting them to explore new opportunities and engage with their communities of choice. Life Stream Australia encourages participants to identify opportunities for growth and development. Life Stream Australia provides Independent Living Support services to individuals and groups living in their own homes. The support provided can be direct assistance; planning; and developmental assistance as the participant requires. ​Link participants with neighbours and local community supports. Connect and use local services close to the participants home. Support participants with running their home, i.e., shopping, cleaning, washing, cooking. Greenhouse is Life Stream Australia’s first centre based overnight service located in Rockhampton. Greenhouse can accommodate up to 4 persons (depending on support needs) in a welcoming family home environment. Greenhouse is fully accessible for individuals with mobility challenges, including a fully accessible bathroom, hoist and furniture and fittings to maximise independence and comfort. Life Stream Australia will work alongside any funding agency on either a short term or recurrent basis to fund your stay. Greenhouse is available to guests all year long. Life Stream Australia’s Behaviour Support Team can provide timely, developmental and proactive support to individuals and their families in response to behaviours they demonstrate that may be complex or challenging. The Behaviour Support Team is a group of experienced, trained staff who provide support to clients according to the Positive Behaviour Support Framework. Access to the Behaviour Support Team is via a referral and families can self-refer. The Behaviour Support Team can provide cost effective packages for the development, implementation and evaluation of Positive Behaviour Support Plans. Life Stream Australia believes that through participation in community activities, recreation, leisure & sport and having friendships and responsibilities, people develop all types of skills and lead healthy, active and meaningful lives. With your financial donation we can support the essential work ​for people with disability and their families.